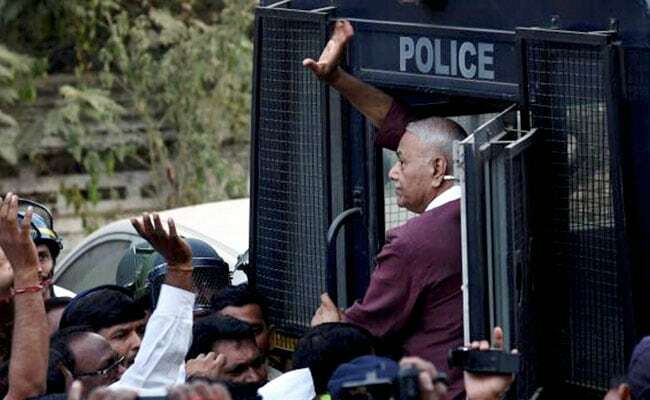 Yashwant Sinha, who has had frequent run-ins with the current BJP leadership, was detained on Monday evening while protesting outside the Akola district collector's office against the state government's "apathy" towards the farmers of Vidarbha. Mumbai: The Shiv Sena today said the response garnered by BJP veteran Yashwant Sinha's agitation in Maharashtra over farmers' issues should set off alarm bells for the state government. The former Union minister, who has had frequent run-ins with the current BJP leadership, was detained on Monday evening while protesting outside the Akola district collector's office against the state government's "apathy" towards the farmers of Vidarbha. Shiv Sena president Uddhav Thackeray had spoken to the 80-year-old leader over the phone on Tuesday and discussed farmers' issues. Mr Sinha yesterday called off his three-day-old protest in Akola, saying Chief Minister Devendra Fadnavis had assured him that their demands will be met. The Sena today noted that prominent leaders of the country had supported Yashwant Sinha's agitation. "We (referring to Uddhav Thackeray) too spoke to Sinha over phone. The question is about farmers' life and death and thus not worrying about what will happen to power, we supported his agitation," the party said in an editorial in its mouthpiece 'Saamana'. The Sena said that Mr Sinha was never a mass leader but a "bureaucrat-turned-politician". "Yet, if farmers supported his agitation, it should ring alarm bells for the BJP and the government. The government should fulfil the demands of farmers of Akola while it has the time," it opined. "However, in reality the government spent crores of rupees on advertisements even before the actual loan waiver was implemented, to gain credit. Like the Ram temple in Ayodhya, the loan waiver is also stuck in announcements," it quipped. Mr Sinha also didn't have any new demands but only wanted old promises to be fulfilled, the Sena said, adding that the farmers stood with him because the "disappointed and victimised" cultivators do not know what to do. Questioning those criticising Yashwant Sinha, the editorial said if the former Union minister was going against his own party due to his personal grudges, how could he get such a stupendous response in Akola. "Why did the chief minister and (revenue minister) Chandrakant Patil plead Sinha to take back the agitation? That was because this agitation could turn ugly and affect the upcoming Winter session of the state Legislature," it said.